Dietmar Winkler is senior researcher at the Vienna University of Technology as member of the research group for Quality Software Engineering at the Institute for Information Systems Engineering, Information and Software Engineering Group. Since 2017 he is working as key researcher in the Christian Doppler Laboratory on Security and Quality Improvement in the Production Systems Life Cycle (CDL-SQI). Additionally he is working as a consultant for quality assurance and process management in software engineering and as quality management consultant in the automotive business area. From 2010-2017 he worked as project assistant and key resarcher for Quality Assurance and Engineering Process improvement in the Christian Doppler Laboratory “Software Engineering Integration for Flexible Automation Systems” at TU Wien. In 2016 he worked as senior researcher at SBA Research. In 2008 he received a scholarship (by Siemens Austria and the Faculty of Informatics, TU Vienna) for a 4 months research stay at the Fraunhofer Institute of Experimental Software Engineering in Kaiserslautern (DE). In 2007 he worked as a guest researcher at Czech Technical University, Department of Cybernetics in Prague (CZ). Journal Paper Published: “Status Quo in Requirements Engineering: A Theory and Global Family of Surveys” (authored by: Wagner S., Mendez-Fernandez D., Felderer M., Vetro A., Kalinowski M., Wieringa R., Pfahl D., Conte T., Christiansson M-T., Greer D., Lassenius C., Männistö T., Nayebi M., Ovio M., Penzenstadler B., Prikladnicki R., Ruhe G., Schekelmann A., Sen S., Spinola R., Tuzcu A., De La Vara J.L., Winkler D.). Published at ACM TOSEM [DOI]. Conference Paper Cond. Accepted: “A Preliminary Comparison of Using Variability Modeling Approaches to Represent Experiment Families” (authored by: Neto A.A., Kalinowski M., Garcia A., Winkler D., Biffl S.). Proceedings of EASE 2019. Conference Paper Accepted: “Product/ion-Aware Analysis of Multi-Disciplinary Systems Engineering Processes” (authored by: Kathrein L., Lüder A., Meixner K., Winkler D., Biffl S). Proceedings of ICEIS 2019. 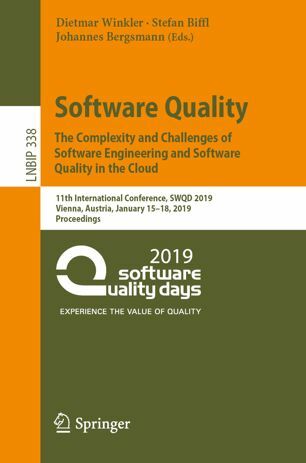 Call for Papers: Software Quality Days 2020, Vienna Austria, Abstract: 24.05.2019, Full / Short Paper: 31.05.2019. Call for Participation: Euromicro SEAA SPPI Track and Euromicro SEAA EsPreSSE Session, Thessaloniki / Chalkidiki, Greece, 28.-30.08.2019. CROWDWORK – Platform-Based Self-Organization for Crowdwork, Contract Research, 02.2017-02.2018, Co-Project Management. TAMES – Test automation for a modular embedded system test bed, Contract Research 05.2017-12.2017, Co-Project Management. SemSEA – Method and Tool support for semantic search across heterogeneous and changing best-practice examples in context of software architectures, Contract Research, 05.2016-05.2017, Co-Project Management. CDL-Flex – Christian Doppler – Laboratory for Software Engineering Integration for flexible automation systems, Research Funding, CDG, 01.2010-12.2016, Key Researcher. BenchmarkDP, Research Funding, WWTF, 11.2012-11.2015, Researcher & Project Member. logi.DIAG – Test-Driven Automation within the logi.cals systems environment, Research Funding, FFG, 09.2008-01.2011, Researcher & Project Member. Software Engineering and Project Management; Advanced Software Engineering. Software Quality Assurance; Software Quality Management. See TISS for more details and current topics for PR/SEM/DA. Software/Systems Engineering, Software Processes and Software Process Improvement. Empirical and Value-Based Software Engineering. Model-Driven Software and Systems Development. Quality Assurance and Quality Management, Software Inspection. Neto A.A., Kalinowski M., Garcia A., Winkler D., Biffl S.: “A Preliminary Comparison of Using Variability Modeling Approaches to Represent Experiment Families”, In: Proceedings of the 23rd International Conference on Evaluation and Assessment in Software Engineering (EASE), Emerging Results and Vision Paper Track, Copenhagen, Denmark, 14.-17.04.2019. (conditionally accepted). Kathrein L., Lüder A., Meixner K., Winkler D., Biffl S.: „Product/ion-Aware Analysis of Multi-Disciplinary Systems Engineering Processes“, In: Proceedings of the 21st International Conference on Enterprise Information Systems (ICEIS), Heraklion, Crete, Greece, 2019. (accepted). Kalinowski M., Gracioli Neto C., Anderlin Neto A., de Oliveria D.C.M, Sabou M., Winkler D., Biffl S.: ‘Using Model Scoping with Expected Model Elements to Support Software Model Inspections: Results of a Controlled Experiment’, In: Proceedings of the 21st International Conference on Enterprise Information Systems (ICEIS), Heraklion, Crete, Greece, 2019. (accepted)..
Wagner S., Mendez-Fernandez D., Felderer M., Vetro A., Kalinowski M., Wieringa R., Pfahl D., Conte T., Christiansson M-T., Greer D., Lassenius C., Männistö T., Nayebi M., Ovio M., Penzenstadler B., Prikladnicki R., Ruhe G., Schekelmann A., Sen S., Spinola R., Tuzcu A., De La Vara J.L., Winkler D.: ‘Status Quo in Requirements Engineering: A Theory and Global Family of Surveys’, In: ACM Transactions on Software Engineering and Methodology (TOSEM), ACM, ISSN: 1049-331X, pp; 9:1–9:48, February, 2019. [DOI]. Meixner K., Winkler D., Novak P. Biffl S.: “Towards Model-driven Verification of Robot Control Code using Abstract Syntax Trees in Production Systems Engineering”, In: Proceedings of the 7th International Conference on Model-Driven Engineering and Software Development, Modelswards, Short Paper, Prague, Czech Republic, February, 20-22, 2019. Meixner K., Winkler D., Biffl S.: “Towards Variability Management in Software Test Automation”, In: Proceedings of the 13th International Workshop on Variability Modelling of Software-Intensive Systems (VAMOS), February 6-8, Leuven, Belgium, 2019. Winkler D., Rinker F., Kieseberg P.: “Towards a Flexible and Secure Round-Trip-Engineering Process for Production Systems Engineering with Agile Practices”, In: Proceedings of the 11th Software Quality Days, Scientific Program, Lecture Notes on Business Information Processing, LNBIP, Volume 338, Springer, Vienna, Austria, 2019. [Spingerlink]. Winkler D.: “Christian Doppler Labor für die Verbesserung von Sicherheit und Qualität in Produktionssystemen (CDL-SQI), Presentation at the SPS/IPC/Drives Tool Fair; VDMA Forum, 28.11.2018. [Presentation]. Mazak A., Lüder A., Wolny S., Wimmer M., Winkler D., Kirchheim K., Rosendahl R., Bayanifar H., Biffl S.: “Model-based generation of run-time data collection systems exploiting AutomationML”, In: Automatisierungstechnik 66(10), De Gruyter, ISSN (Online) 2196-677X, ISSN (Print) 0178-2312, pp. 819-833, 2018. [Link to Publisher]. Winkler D., Meixner K., Biffl S.: ‘Towards Flexible and Automated Testing in Production Systems Engineering Projects’, In: Proceedings of the 23rd International Conference on Emerging Technologies and Factory Automation, IEEE, pp.1-8, Torino, Italy, September 4-7, 2018. Sabou M., Winkler D., Penzerstadler P., Biffl S.: ‘Verifying Conceptual Domain Models with Human Computation: A Case Study in Software Engineering’, In: Proceedings of the 6th AAAI Conference on Human Computation and Crowdsourcing (HCOMP), AAAI, Zurich, Switzerland, July 5.-8, 2018 [Link to Publisher]. Winkler D., Sabou M., Petrovic S., Carneiro G., Kalinowski M., Biffl S.: “Improving Model Inspection Processes with Crowdsourcing: Findings from a Controlled Experiment”, In: Proceedings of the 24th EuroSPI Conference on Systems Software and Service Process Improvement, ISBN: 978-3-319-64217-8, CCIS, Volume 748, pp.125-137, Ostrava, Czech Republic, September 5-8, 2017. [Springerlink][Presentation]. Winkler D., Sabou M., Petrovic S., Carneiro G., Kalinowski M., Biffl S.: “Investigating Model Quality Assurance with a Distributed and Scalable Review Process”, In: Proceedings of the 20th Ibero-American Conference on Software Engineering, Experimental Software Engineering (ESELAW) Track, Springer, Buenos Aires, Argentina, 2017. Carneiro G., Laigner R., Kalinowski M., Winkler D., Biffl S.: “Investigating the Influence of Inspector Learning Styles on Design Inspections: Findings of a Quasi-Experiment”, In: Proceedings of the 20th Ibero-American Conference on Software Engineering, Experimental Software Engineering (ESELAW) Track, Springer, missing, missing, Buenos Aires, Argentina, 2017. Winkler D., Sabou M., Petrovic S., Biffl S., Kalinowski M., Carneiro G.: “Improving Model Inspection with Crowdsourcing”, In: Proceedings of the 4th International Workshop on Crowdsourcing in Software Engineering, ACM/IEEE International Conference on Software Engineering (ICSE), Buenos Aires, Argentinia, 2017. Winkler D., Wimmer M., Berardinelli L., Biffl S.: „Model Quality Assurance for Multi-Disciplinary Engineering”, In: Biffl S., Lüder A., Gerhard D. (eds): “Multi-Disciplinary Engineering of Cyber-Physical Production Systems”, Book Chapter, Chapter 17, pp. 433-457, 2017. [Springerlink]. Winkler D., Biffl S., Bergsmann J. (eds): “Software Quality: Complexity and Challenges of Software Engineering in Emerging Technologies”; Proceedings of the 9th International Conference, SWQD 2017, Vienna, Austria, January 17.-20.01.2017. [Springer]. Winkler D., Biffl S.: “Collaborative Model Review Support for AutomationML, In: Proceedings of the 4th AutomationML User Conference, Esslingen, Germany, 2016. [presentation, pdf, 1.3MB]. Winkler D., Musil J., Musil A., Biffl S.: “Collective Intelligence-Based Quality Assurance: Combining Inspection and Risk Assessment to Support Process Improvement in Multi-Disciplinary Engineering”, In: Proceedings of the 23rd EuroAsiaSPI Conference, Graz, Austria, 2016. [presentation, pdf, 150kB][Springerlink]. Winkler D., F.J. Ekaputra, Biffl S.: “AutomationML Review Support in Multi-Disciplinary Engineering Environments”, Proceedings of the 21st IEEE International Conference on Emerging Technologies and Factory Automation (ETFA), Berlin, Germany, 2016. Mordinyi R., Winkler D., Ekaputra F., Wimmer M., Biffl S.: “Investigating Model Slicing Capabilities on Integrated Plant Models with AutomationML”, Proceedings of the 21st IEEE International Conference on Emerging Technologies and Factory Automation (ETFA), Berlin, Germany, 2016. Biffl S., Lüder A., Winkler D.: „Multi-Disciplinary Engineering for Industrie 4.0: Semantic Challenges, Needs, and Capabilities“, In: Biffl S., Sabou M. (Eds. ): “Semantic Web for Intelligent Engineering Applications”, Springer, 2016. [Springerlink]. Biffl S., Mordinyi R., Steininger H., Winkler D.: „Integrationsplattform für anlagenmodellorientiertes Engineering – Bedarfe und Lösungsansätze“, In: Vogel-Heuser B., Bauernhansl T., ten Hompel M. (Eds. ): Handbuch Industrie 4.0″, 2. Auflage, Springer Nachschlagewissen [Springerlink]. Winkler D., Mordinyi R., Biffl S.: „Qualitätssicherung in heterogenen und verteilten Entwicklungsumgebungen für industrielle Produktionssysteme“, In: Vogel-Heuser B., Bauernhansl T., ten Hompel M. (Eds. ): Handbuch Industrie 4.0″, 2. Auflage, Springer NachschlageWissen [Springerlink]. Kalinowski M., Felderer M., Conte T., Spinola R., Prikladnicki R., Winkler D. Mendez D., Wagner S.: ‘Preventing Incomplete/Hidden Requirements: Reflections on Survey Data from Austria and Brasil’, In: Proceedings of the 8th Software Quality Days, Scientific Program, Lecture Notes in Business Information Processing, LNBIP, Springer, Vienna, Austria, 18.-21.01, 2016, (Best Research Paper Award) [Springerlink]. Winkler D., Biffl S., Bergsmann J. (eds): “Software Quality: The Future of Software Quality”; Proceedings of the 8th International Conference, SWQD 2016, Vienna, Austria, January 18.-21.01.2016. [Springerlink]. Winkler D.: “Improving Engineering Processes and Quality Assurance in Heterogeneous Engineering Environments’”, PhD Thesis, Vienna University of Technology, Austria, Dec. 2015. [Presentation, 1MB]. 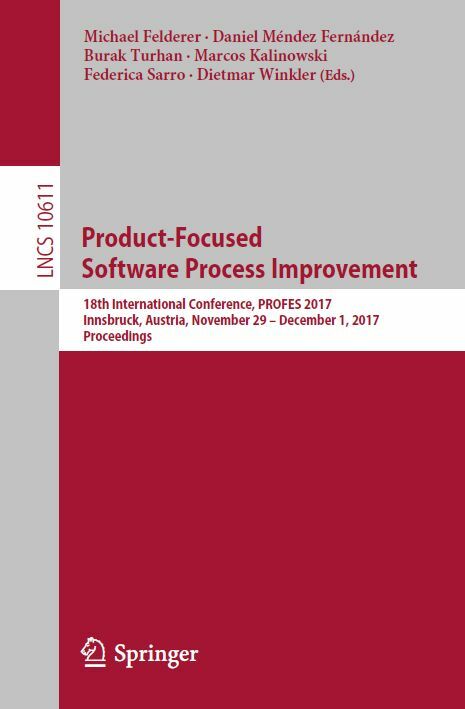 Winkler D., Biffl S.: “Focused Inspections to Support Defect Detection in Multi-Disciplinary Engineering Environments”, Research Preview Paper, In: Proceedings of the 16th International Conference on Product-Focused Software Process Improvement (PROFES), Bozen-Bolzano, Italy, December 2-4, 2015. [Springerlink][Presentation, 130KB]. Winkler D., Biffl S., Steininger H.: “Integration von heterogenen Engineering-Daten mit AutomationML und dem AML.hub: Konsistente Daten über Fachbereichsgrenzen hinweg”, develop3, Ausgabe 3/2015. Biffl S., Kalinowski M., Rabiser R., Ekaputra F., Winkler D.: „Systematic Knowledge Engineering: Building Bodies of Knowledge from Published Research“, In: International Journal of Software Engineering and Knowledge Engineering (IJSEKE), Special Issue on selected SEKE Papers, IJSEKE 24(10), pp. pp. 1533-1571, December 2014. Kovalenko O., Serral E., Sabou M., Ekaputra F.J., Winkler D., Biffl S.: “Automating Cross-Disciplinary Defect Detection in Multi-Disciplinary Engineering Environments”, Proceedings of 19th International Conference on Knowledge Engineering and Knowledge Management (EKAW), Linköping, Sweden, 24.-28.11. 2014. Ekaputra F., Serral E., Winkler D., Biffl S.: „Addressing Data Integration and Communication Issues in Project Consortia”, Proceedings of the International Conference on Data and Software Engineering (ICoDSE), November 26th-27th, 2014 in Aula Timur (East Hall), Institut Teknologi Bandung (ITB), Bandung, Indonesia. Best Paper Award. Biffl S., Lüder A., Schmidt N., Winkler D.: “Early and Efficient Quality Assurance of Risky Technical Parameters in a Mechatronic Design Process”, Proceedings of IECON, 28.10.-01.11.2014, Dallas, Texas, US, 2014. Biffl S., Kalinowski M., Ekaputra F.J., Neto A.A.., Conte T., Winkler D.: “Towards a Semantic Knowledge Base on Threats to Validity and Control Actions in Controlled Experiments”, Short Paper, Proceedings of ESEM, 18.-19.09.2014, Torino, Italy. Winkler D., Ekaputra F., Serral E., Biffl S.: “Efficient Data Integration and Communication Issues in Distributed Engineering Projects and Project Consortia”, Proceedings of I-KNOW, September 16.-19th, Graz, Austria. Biffl S., Winkler D., Mordinyi R., Scheiber S., Holl G.: “Efficient Monitoring of Constraints in a Multi-Disciplinary Engineering Project with Semantic Data Integration in the Multi-Model Dashboard Process”, Proceedings of ETFA, September 16th-18th, Barcelona, Spain, 2014. [Presentation, 600KB]. Mordinyi R., Serral E., Winkler D., Biffl S.: “Evaluating Software Architectures using Ontologies for Storing and Versioning of Engineering Data in Heterogeneous Systems Engineering Environments”, Proceedings of ETFA, September 16th-18th, Barcelona, Spain, 2014. [Presentation, 1.1MB]. Grünwald A., Winkler D., Biffl S.: “The Semantic Model Editor: Efficient Data Modeling and Integration based on OWL Ontologies”, Proceedings of Semantics, 04.09.-05.09.2014, Leipzig, Germany, 2014. (Nominated for Best Paper Award). Winkler D., Schönbauer M., Biffl S.: “Towards Automated Process and Workflow Management: A Feasibility Study on Tool-Supported and Automated Engineering Process Modeling Approaches”, Proceedings of the Euromicro SEAA Conference, Software Management Track, August 27th-29th, Verona, Italy, 2014. [Presentation, 425KB]. Biffl S., Kalinowski M., Ekaputra F., Serral E., Winkler D.: Building Empirical Software Engineering Bodies of Knowledge with Semantic Knowledge Engineering”, Proceedings of SEKE, Vancouver, Canada, July 1st-3rd, 2014. Winkler D., Biffl S.: Guest Editorial: Special Section on Selected Papers from the Software Quality Days (SWQD) Conferences in 2012 and 2013, Special Issue 22(3), Springer, September 2014. Ramler R., Putschögl W., Winkler D.: Automated Testing of Industrial Automation Software: Practical Receipts and Lessons Learned; Proceedings of the 1st Workshop on Modern Software Engineering Methods for Industrial Automation (MoSEMInA), in conjunction of the 36th International Conference on Software Engineering (ICSE), Hyderabad, India, 2014. Winkler D., Biffl S., Bergsmann J. (eds): “Software Quality: Model-Based Approaches for Advanced Software and Systems Engineering”; Proceedings of the 6th International Conference, SWQD 2014, Vienna, Austria, January 14-16, [Springerlink], 2014. Winkler D.: “Effiziente Datenintegration zur Verbesserung der Projekt- und Prozessqualität in heterogenen Entwicklungsprojekten”, Gastkommentar, Computerwelt, Ausgabe 25, 2013. Fay A., Biffl S., Winkler D., Drath R., Barth M.: „A Method to Evaluate the Openness of Automation Tools for Increased Interoperability”, Proceedings of the 39th Annual Conference of the IEEE Industrial Electronics Society (IECON), Vienna, Austria, 10-13.11.2013. Mordinyi R., Prybila C., Winkler D., Biffl S.: “Communication in Multi-discipline Engineering Projects using Local Data Point References”, Proceedings of the 39th Annual Conference of the IEEE Industrial Electronics Society (IECON), Vienna, Austria, 10-13.11.2013. Serral E., Mordinyi R., Kovalenko O., Winkler D., Biffl S.: Evaluation of Semantic Data Storages for Integrating Heterogeneous Disciplines in Automation Systems Engineering”, Proceedings of the 39th Annual Conference of the IEEE Industrial Electronics Society (IECON), Vienna, Austria, 10-13.11.2013. Barth M., Biffl S., Drath R., Fay A., Winkler D.: “Bewertung der Offenheit von Engineering-Tools”, Journal, OpenAutomation, 3/2013, VDE Verlag, 2013. Biffl S., Serral E., Winkler D., Dieste O., Juristo N., Condori-Fernandez N.: „Replication Data Management: Needs and Solutions – An evaluation of conceptual approaches for integrating heterogeneous replication study data”, Proceedings of the 7th International Symposium on Empirical Software Engineering and Measurement (ESEM), Baltimore, Maryland, USA, 10.-22.10.2013. Ekaputra F.J., Serral E., Winkler D., Biffl S.: „An Analysis Framework for Ontology Querying Tools“, Proceedings of the I-Semantics Conference, in conjunction with the 13h International Conference on Knowledge Management and Knowledge Technologies (I-KNOW) Graz, Austria, 04.-06.09.2013. Best Paper Award. Biffl S., Musil J., Serral E., Winkler D.: “A Semantic Directory for Content and Partner Discovery in Empirical Software Engineering Research”, Proceedings of the 39th Euromicro Conference on Software Engineering and Advanced Applications (SEAA), Work in Progress, Santander, Spain, 4.-6.09.2013. Grünwald A., Winkler D., Serral E., Biffl S.: „Semantic Technologies to Accelerate Model-Driven Development“, Proceedings of the 39th Euromicro Conference on Software Engineering and Advanced Applications (SEAA), Work in Progress, Santander, Spain, 4.-6.09.2013. Winkler D., Mordinyi R., Biffl S.: “Research Prototypes versus Products: Lessons Learned from Software Development Processes in Research Projects”, Proceedings of the 20th EuroSPI Conference, Dundalk, Irelande, 25.-27.06.2013. [Presentation, 650KB][Springerlink]. Proenca D., Antunes G., Borbinha J., Caetano A., Biffl S., Winkler D., Becker C.: “Longevity as an Information Systems Design Concern”, Short Paper, Forum, Proceedings of CAiSE’13 Forum, Valencia, Spain, 17.-21.06.2013. Winkler D., Kitzler M., Steindl C., Biffl S.: “Investigating the Impact of Experience and Solo/Pair Programming on Coding Efficiency: Results and Experiences from Coding Contests”, Proceedings of the 14th International Conference on Agile Software Development (XP 2013), Vienna, Austria, 03.-07.06.2013. [Presentation, 670KB][Springerlink]. Hametner R., Kormann B., Vogel-Heuser B., Winkler D., Zoitl A.: „Automated Test Case Generation for Industrial Control Applications“, Book Chapter, in Sen Gupta, G.; Bailey, D.; Demidenko, S. & Carnegie, D. (Eds. ), “Recent Advances in Robotics and Automation”, Volume 480, Springer, pp.263-273, 2013, [Springerlink]. Sunindyo W., Moser T., Winkler D., Mordinyi R.: „Project Progress and Risk Monitoring in Automation Systems Engineering“, 5th Software Quality Days, Scientific Track, Vienna, Austria, 15.-17.01.2013. Winkler D., Biffl S., Bergsmann J. (eds): “Software Quality: Increaseing Value in Software and Systems Development”; Proceedings of the 5th International Conference, SWQD 2013, Vienna, Austria, January 17-19, [Springerlink], 2013. Sunindyo W.D., Moser T., Winkler D., Mordinyi R., Biffl S.: „Workflow Validation Framework in Collaborative Engineering Environments“, Book Chapter, In: Loo, A.W: “Distributed Computing Innovations for Business, Engineering, and Science”, IGI Global, ISBN: 978-1-4666-2533-4, 2013. Hametner R., Winkler D., Zoitl A.: “Agile Testing Concepts Based on Keyword-Driven Testing for Industrial Automation Systems”, 38th Annual Conference of the IEEE Industrial Electronics Society (IECON), Montreal, Canada, 25.-28.10.2012. Moser T., Mordinyi R., Winkler D.: “Extending Mechatronic Objects for Automation Systems Engineering in Heterogeneous Engineering Environments”, 17th IEEE International Conference on Emerging Technologies and Factory Automation (ETFA), Krakow, Poland, 17.-21.09.2012..
Ramler R., Winkler D., Schmidt M.: „Random Test Case Generation and Manual Unit Testing: Substitute or Complement in Retrofitting Tests for Legacy Code“, 38th Euromicro Conference, SEAA, 2012, Cesme, Izmir, Turkey, 5.-9.9.2012. Musil J., Musil A., Winkler D., Biffl S.: “A First Account on Stigmergic Information Systems and their Impact on Platform Development”, Nordic Symposium on Cloud Computing and Internet Technology (Nordic Cloud), co-located with the 10th Working IEEE/IFIP Conference on Software Architecture (WICSA) and the 6th European Conference on Software Architecture (ECSA), Helsinki, Finland, 20.-24.08.2012. 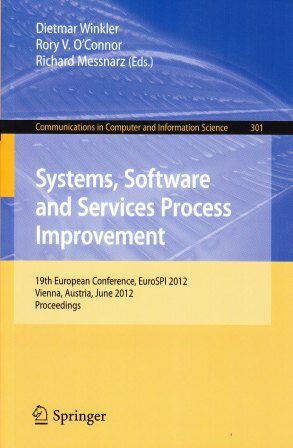 Winkler D., O’Connor R.V., Messnarz R. (eds): “Systems, Software and Service Process Improvement: Proceedings of the 19th European EuroSPI Conference”, Communication in Computer and Information Science, Springer, Vienna, Austria, June 25-27, ISBN: 978-3-642-31198-7 [Springerlink],2012. Winkler D., Schmidt M., Ramler R., Biffl S.: „Improving Unfamiliar Code with Unit-Tests: An Empirical Investigation on Tool-Supported and Human-Based Testing”, 13th International conference on Product-Focused Software Development and Process Improvement, Madrid, Spain, 13.-15.06.2012, [Presentation, 480KB]. Winkler D., Biffl S.: “Improving Quality Assurance in Automation Systems Development Projects”, In “Quality Assurance and Management”, Book Chapter, Intec Publishing, ISBN 979-953-307-494-7, 2012 [Link to Chapter]. Sunindyo W.D., Moser T., Winkler D.: “Improving Open Source Software Process Quality Based on Defect Data Mining”, Software Quality Days 2012, Research Track, Vienna, Austria, 17.-19.01.2012. Biffl S., Winkler D., Bergsmann J. (eds): “Software Quality: Process Automation in Software Development”; Proceedings of the 4th International Conference, SWQD 2012, Vienna, Austria, January 17-19, 2012. Sunindyo W.D., Moser T., Winkler D.: “Process Model Validation for Heterogeneous Engineering Environments”, Software Quality Days 2012, Practical Track, Vienna, Austria, 17.-19.01.2012. Sunindyo W.D., Moser T., Winkler D., Biffl S.: “Analyzing OSS Project Health with Heterogeneous Data Sources”, International Journal on Open Source Software and Processes, IJOSSP 3(4), pp.1-23, 2011. Hametner R., Kormann B., Vogel-Heuser B., Winkler D., Zoitl A.: “Test Case Generation Approach for Industrial Automation Systems”, 5th International Conference on Automation, Robotics and Aplications (ICARA), Wellington, New Zealand, 6.-8.12.2011. Sunindyo W.D., Moser T., Winkler D., Mordinyi R., Biffl St.: “Workflow Validation Framework in Distributed Engineering Environments”, 3rd International Workshop on Information Systems in Distributed Environments (ISDE), Crete, Greece, 17.-21.10.2011. Winkler D.: “Quality Assurance Aspects in Automation Systems Engineering Projects: Challenge and Lessons Learned from Industry Prototype Application”, invited Paper, 1st Workshop on Industrial Automation Tool Integration for Engineering Project Automation (iATPA), in conjunction with 16th IEEE International Conference on Emerging Technologies and Factory Automation (ETFA), Toulouse, France, 09.09.2011. Moser T., Mordinyi R., Winkler D., Melik-Merkumians M., Biffl S.: „Efficient Automation Systems Engineering Process Support Based on Semantic Integration of Engineering Knowledge“, 16th IEEE International Conference on Emerging Technologies and Factory Automation (ETFA), Toulouse, France, 05.-09.09.2011. Moser T., Mordinyi R., Winkler D., Biffl S.: “Engineering Project Management using the Engineering Cockpit: A collaboration platform for project managers and engineers”, 9th International Conference on Industrial Informatics (INDIN), Caparica, Lisbon, Portugal, 26.-29.07.2011. Moser T., Winkler D., Heindl M., Biffl S.: “Automating the Detection of Complex Semantic Conflicts between Software Requirements: An empirical study on requirements conflict analysis with semantic technology”, 23rd International Conference on Software Software Engineering and Konwledge Engineering (SEKE), Miami Beach, USA, 07.-09.07.2011. Moser T., Biffl S., Sunindyo W.D., Winkler D.: “Integrating Production Automation Expert Knowledge Across Engineering Domains”, International Journal of Distributed Systems and Technologies (IJDST), Special Issue on Emerging Trends and Challenges in Large-Scale Networking and Distributed Systems, Volume 2, Number 3, April-Juni, pp.88-103, 2011. Winkler D., Moser T., Mordinyi R., Sunindyo W.D., Biffl S.: “Engineering Object Change Management Process Observation in Distributed Automation Systems Projects”, 18th EuroSPI Conference, Roskilde, Denmark, 27.-29.06.2011, [Presentation, 750KB]. Moser T., Winkler D., Heindl M., Biffl S.: „Requirements Management with Semantic Technology: An empirical study on automated requirements categorization and conflict analysis“, Int. Conf. on Advanced Information Systems Engineering (CAiSE), London, GB, 20.-24.06.2011. Winkler D., Biffl S.: “Interdisziplinäres Softwareentwicklungsprojekte: Änderungsmanagement über Werkzeuggrenzen hinweg”, Software and Systems Engineering Essentials (SEE), Frankfurt, Germany, 9.-10.05.2011, [Presentation, 980KB]. Winkler D., Biffl S.: “Angepasste Testverfahren für automatisches Testen von Automatisierungssystemen”, Software and Systems Engineering Essentials (SEE), Frankfurt, Germany, 9.-10.05.2011, [Presentation, 890KB]. Biffl S., Moser T., Winkler D.: “Risk Assessment in Multi-Disciplinary (Software+) Engineering Projects”, International Journal of Software Engineering and Knowledge Engineering (IJSEKE), Special Session on Risk Assessment, Volume 21, Number 2, March, pp.211-236, 2011. Moser T., Waltersdorfer F., Winkler D., Biffl S.: “Version Management and Conflict Detection across Tools in a (Software+) Engineering Environment”, Software Quality Days 2011, Vienna, Austria, 18.01.-20.01.2011, [Presentation, 940KB]. Murth M., Winkler D., Biffl S., Kühn e., Moser T.: “Performance Testing of Semantic Publish/Subscribe Systems”, 9th International Conference on Ontologies, Databases, and Applications of Semantics (ODBASE), Poster, Crete, Greece, 26.-28.10.2010. Sunindyo W.D., Moser T., Winkler D., Biffl S.: “A Process Model Discovery Approach for Enabling Model Interoperability in Signal Engineering”, 1st Workshop on Model Driven Interoperability (MDI), Oslo, Norway, 05.10.2010. Frühwirth C., Biffl S., Schatten A., Winkler D., Sunindyo W.D. : „Quantitative Software Security Measurement in an Engineering Service Bus Platform“, 4th International Symposium on Empirical Software Engineering and Measurement (ESEM), Poster, Bolzano-Bozen, Italy, 16.-17.09.2010. Sunindyo W.D., Biffl S., Mordinyi R., Moser T., Schatten A., Tabatabai M., Wahyudin D., Weippl E., Winkler D.: “Event-Based Empirical Process Analysis Framework”, 4th International Symposium on Empirical Software Engineering and Measurement (ESEM), Poster, Bolzano-Bozen, Italy, 16.-17.09.2010. Winkler D., Hametner R., Östreicher T., Biffl S.: „A Framework for Automated Testing of Automation Systems“,15th IEEE International Conference on Emerging Technologies and Factory Automation (ETFA), Work in Progress Session, Bilbao, Spain, 13.-16.09.2010. Hametner R., Winkler D., Östreicher T., Surnic N., Biffl S.: „Selecting UML Models for Test-Driven Development along the Automation Systems Engineering Process“, 15th IEEE International Conference on Emerging Technologies and Factory Automation (ETFA), Work in Progress Session, Bilbao, Spain, 13.-16.09.2010. Winkler D., Elberzhager F., Biffl S., Eschbach R.: Software Process Improvement Initiatives based on Quality Assurance Strategies: A QATAM Pilot Application“,17th European Systems & Software Process Improvement and Innovation (EuroSPI), Grenoble, France, 01-03.09.2010, [Presentation, 300KB]. Musil J., Schweda A., Winkler D., Biffl S.: Improving Video Game Development: Facilitating Heterogeneous Team Collaboration Through Flexible Software Processes”, 17th European Systems & Software Process Improvement and Innovation (EuroSPI), Grenoble, France, 01-03.09.2010, [Presentation, 250KB]. Sunindyo W.D., Biffl S., Frühwirth C., Mordinyi R., Moser T., Schatten A., Schrittwieser S., Weippl E., Winkler D.: “Defect Detection Using Event-Based Process Analysis in (Software+) Engineering Projects“,36th Euromicro Conference, Work in Progress Session, Software Engineering and Advanced Applications (SEAA), Lille, France, 01-03.09.2010. Sunindyo W.D., Moser T., Winkler D., Biffl S.: „Foundations for Event-Based Process Analysis in Heterogeneous Software Engineering Environments”, 36th Euromicro Conference, Software Engineering and Advanced Applications (SEAA), Lille, France, 01-03.09.2010. Hametner R., Winkler D., Östreicher T., Biffl S., Zoitl A.: “The Adaptation of Test-Driven Software Processes to Industrial Automation Engineering”, 8th IEEE International Conference on Industrial Informatics (INDIN), Osaka, Japan, 2010. Winkler D., Faderl K., Biffl S.: “Investigating the Temporal Behavior of Defect Detection in Software Inspection and Inspection-Based Testing”, 11th International Conference on Product Focused Software Development and Process Improvement (Profes), Limerick, Ireland, 2010, [Presentation, 140KB]. Moser T., Biffl S., Winkler D.: “Process-Driven Feature Modeling for Variablity Management of Project Environment Configurations”, 11th Conference on Product Focused Software Development and Process Improvement (Profes), Limerick, Ireland, 21.-23.06.2010, Presentation, 230KB]. Musil J., Schweda A., Winkler D., Biffl S.: „Synthesized Essence: What Game Jams Teach About Prototyping of New Software Products“, 32nd International Conference on Software Engineering (ICSE), New Ideas and Emerging Results (NIER) Track, Cape Town, South Africa, 2.-8.5.2010. Winkler D.: “Empirical Software Engineering – An Introduction”, Guest Lecture at Universidad Politécnica de Madrid, Spain, 07.04.2011. Winkler D., Biffl S.: “Engineering Environment Integration Across Disciplines with the Engineering Service Bus”, SEE Conf 2010, Cologne, Germany, 2010, [Presentation, 1.3MB]. Winkler D., Biffl S., Seemann C.: “A Controlled Experiment on Team Meeting Style in Software Architecture Evaluation”, Conference on Evaluation and Assessment in Software Engineering (EASE), Keele, Great Britain, 2010, [Presentation, 250KB]. Winkler D., Biffl S., Kaltenbach A.: “Evaluating Tools that Support Pair Programming in a Distributed Engineering Environment”, Conference on Evaluation and Assessment in Software Engineering (EASE), Keele, Great Britain, 2010, [Presentation, 440KB]. Moser T., Biffl S., Sunindyo W.D., Winkler D.: “Integrating Production Automation Expert Knowledge Across Engineering Stakeholder Domains”, International Conference on Complex, Intelligent and Software Intensive Systems, Krakow, Poland, 2010. 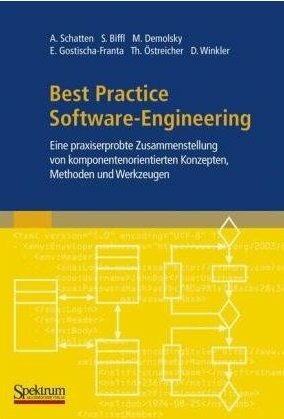 Schatten A., Biffl S., Demolsky M., Gostischa-Franta E., Östreicher T., Winkler D.: „Best-Practice Software-Engineering“, Spektrum Akademischer Verlag, 1. Auflage, March 2010. Winkler D.: „Engineering Environment Integration Across Disciplines with the Engineering Service Bus: A Platform for integrating (Software+) Engineering Environments“, logi.cals Powerdays, Monheim, Germany, 28./29.10.2009. Winkler D., Hametner R., Biffl S.: „Automation Component Aspects for Efficient Unit Testing“, 14th IEEE International Conference on Emerging Technologies and Factory Automation, Mallorca, Spain, 2009. Winkler D., Biffl S., Östreicher T.: “Test-Driven Automation – Adopting Test-First Development to Improve Automation Systems Engineering Processes”, 16th EuroSPI Conference, Alcala de Henares, Madrid, Spain, 2009, [Presentation, 480KB]. Winkler D., Biffl S.: “Evaluierung von Werkzeugen für Distributed Pair Programming: Eine Fallstudie”, Conference on Software & Systems Engineering Essentials, Berlin, Germany, 2009. Winkler D., John K.: “Ein leicht-gewichtiger Einstieg in SPICE: eine Roadmap zum Erfolg”, Quality Days, Vienna, Austria, 2009, [Presentation, 2.8MB]. 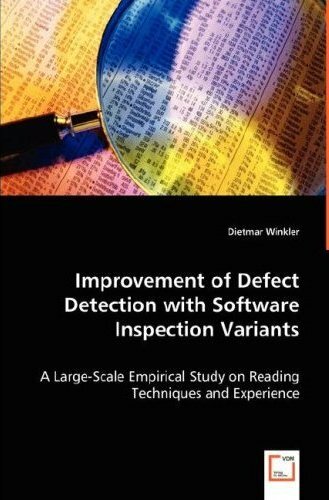 Winkler D.: “Improvement of Defect Detection with Software Inspection Variants: A Large-Scale Empirical Study on Reading Techniques and Experience”, VDM Verlag, May 2008. Winkler D., Elberzhager F., Eschbach R., Biffl S.: “QATAM – A Method to Assess Quality Assurance Strategies”, IESE-Report-No. 092.08/E, Kaiserslautern, Germany, 2008. Winkler D., Biffl S., Ali Babar M.: “An Empirical Investigation of Scenarios Gained and Lost in Architecture Evaluation Meetings”, International Symposium on Empirical Software Engineering and Measurement (ESEM), Short Paper, Kaiserslautern, Germany, 2008, [Presentation, 84KB]. John K., Winkler D., Biffl S.: “Improving Company Processes by applying a Light-weight Process Approach based on the SPICE Maturity Model”, 16th Interdisciplinary Information Management Talks, Jidrichuv Hradec (Neuhaus), Czech Republic, Trauner Verlag, ISBN 978-3-85499-448-0, September 10th-12th, 2008. Wahyudin D., Schatten A., Winkler D., Tjoa A.M., Biffl, S.: “Defect Prediction using Combined Product and Project Metrics: A Case Study from the Open Source “Apache” MyFaces Project Family”, Euromicro SEAA, Parma, Italy, 01.09.-05.09.2008. Vom Brocke J., Thurnher B., Winkler D.: “Measuring the Value of User Participation in Change Projects – Results from Case Studies in the Mobile IT-Service Sector”, 14th Americas Conference on Information Systems (AMCIS), Toronto, Canada, 14.08.-17.08.2008. Vom Brocke J., Thurnher B., Winkler D.: “Improving IT-Service Business Processes by Integrating Mobility: The Role of User Participation”, International Conference on e-Learning, e-Business, Enterprise Information Systems, and e-Government (EEE), Washington, USA, 21.-24.07.2008. Vom Brocke J., Thurnher B., Winkler D.: “The Impact of User Experience on Human Computer Interaction – Results from a Usability Study”, Pacific Asia Conference on Information Systems (PACIS), Suzhou, China, 03.-07.07.2008. Biffl S., Ali Babar M., Winkler D..: “Impact of Experience and Team Size on the Quality of Scenarios for Architecture Evaluation”, Conference on Evaluation and Assessment in Software Engineering (EASE), Bari, Italy, 26.-27.06.2008 (Selected as Best Paper). Vom Brocke J., Thurnher B., Winkler D.: „Making Use of Mobile Devices in E-Commerce: Overcoming Organizational Barriers through User Participation”, 10th International Conference on Enterprise Information Systems (ICEIS), Barcelona, Spain, 12.06.-16.06.2008. Winkler D., Denger C., Elberzhager F., Biffl S.: „QATAM: ein Szenario-basierter Ansatz zur Evaluierung von Qualitätsstrategien“, 2nd Conference on Software & Systems Engineering Essentials, Bern, Schweiz, 28.-30-04.2008, [Presentation, 102KB]. Winkler D.: “Improving Agile Practices with Integrated Quality Assurance Methods”, Siemens PSE Austria, Vienna, 10.12.2008 [Presentation, 290KB]. Winkler D., Biffl S.: “Das ISO 9000:2000 Regelwerk – Ansätze zur Integration des VM XT mit einem Qualitätsmanagementsystem”, in Höhn R. und Höppner S. (editors) “Das V Modell XT: Grundlagen, Methodik und Anwendungen”, eXamen.press, Springer, 2008. Winkler D.: “Empirical Software Engineering (EMSE) – A Vehicle for Evaluating Products and Processes”, Seminar at Gerstner Laboratory, Prague, Czech Republic, 11.12.2007 [Presentation, 1.2MB]. Winkler D.: “Empirical Software Engineering: Introduction & Basic Concepts”, Guest Lecture at Czech Technical University Prague, Czech Republic, 13.11.2007 [Presentation, 1.1MB]. Winkler D.: “Quality Assurance Activities to Support Product Improvement”, Seminar at Gerstner Laboratory, Prague, Czech Republic, 13.11.2007 [Presentation, 200KB]. Winkler D.: “Agile Software Engineering Practice to Improve Project Success”, Seminar at Gerstner Laboratory, Prague, Czech Republic, 17.10.2007 [Presentation, 220KB]. Winkler D.: “Best-Practice Software Engineering: Software Processes to Support Project Success”, 2nd ECOLEAD Summer School on Virtual Enterprises, Collaborative Networks, and Artificial Intelligence Tools for Support of their activities, Invited Talk, Prague, Czech Republic, 06.-08.09.2007 [Presentation, 630KB]. Winkler D., Matousek K., Kubalik J., Biffl S.: “Software Engineering Practices in Multi-Agent Software Development based on the V-Modell XT”, Technical Report, TU Vienna & Czech Technical University, 2007. Ali Babar M., Winkler D., Biffl S.: “Evaluating the Usefulness and Ease of Use of a Groupware Tool fort the Software Architecture Evaluation Process”, 1st International Symposium on Empirical Software Engineering and Measurement (ESEM), Madrid, Spain, 2007. Biffl S., Winkler D.: “Value-Based Empirical Research Plan Evaluation”, 1st International Symposium on Empirical Software Engineering and Measurement (ESEM), Poster, Madrid, Spain, 2007. Biffl S., Denger C., Elberzberger F., Winkler D.: “A Quality Assurance Strategy Tradeoff Analysis Method”, Euromicro SEAA, Work in Progress, Lübeck, Germany, 2007, [Presentation, 50KB]. Wahyudin D., Schatten A., Winkler D., Biffl S.: “Aspects of Software Quality Assurance in Open Source Software Projects: Two Case Studies from Apache Projects”, Euromicro SEAA, Lübeck, Germany, 2007, [Presentation, 150KB]. Winkler D., Thurnher B., Biffl S.: “Early Software Product Improvement with Sequential Inspection Sessions: An Empirical Investigation of Inspector Capability and Learning Effects”, Euromicro SEAA, Lübeck, Germany, 2007, [Presentation, 80KB]. Winkler D., Biffl S.: “Methoden-Tailoring zur Produkt- und Prozessverbesserung: eine V-Modell XT Erweiterung”, 14. Workshop der Fachgruppe WI-VM der Gesellschaft für Informatik e.V., München, 2007, [Presentation, 630KB]. Biffl S., Denger C., Elberzhager F., Winkler D.: “Quality Assurance Tradeoff Analysis Method (QATAM) – An Empirical Quality Assurance Planning and Evaluation Framework”, Technische Universität Wien, Technical Report IFS-QSE-07/04, [pdf, 550KB], 2007. Biffl S., Winkler D.: “Value-Based Empirical Research Plan Evaluation”, Technische Universität Wien, Technical Report IFS-QSE-07/03, [pdf, 90KB], 2007. Winkler D.: “Qualitätssicherung in der Softwareentwicklung”, Wirtschaftskammer Wien, WKO:UBIT, Austria, 18.01.2007 [Präsentation Teil 4a, 150KB][Präsentation Teil 4b, 190KB]. Winkler D.: “Software Prozesse”, Wirtschaftskammer Wien, WKO: UBIT, Austria, 09.11.2006 [Präsentation Teil 1a, 200KB] [Präsentation Teil 1b, 120KB] [Präsentation Teil 1c, 780KB] . Winkler D.: “How to conduct an empirical Study”, Workshop Series “Research Method Seminars (ReMeSe)”, Universität Linz, Austria, 20.10.2006. Biffl S., Winkler D.: “Software-Prozesse mit dem V-Modell XT in Europa”, Nachbericht zur Vortragsreihe des OCG-Arbeitskreises “Software Prozesse”, OCG Journal, 2006. Winkler D.: “Integration of Analytical Quality Assurance Methods into Agile Software Construction Practice: Research Proposal for a Family of Controlled Experiments”, 1st International Doctoral Symposium on Empirical Software Engineering, IDoESE, Rio de Janairo, Brazil, 2006. Winkler D., Varvaroi R., Goluch G., Biffl S.: “An Empirical Study On Integrating Analytical Quality Assurance Into Pair Programming”, Short Paper, ISESE, 2006, [Presentation, 110KB]. Ramler R., Winkler D.: “Exploratory Testing: An Empirical Study Approach”, Work in Progress Session, Euromicro 2006, Croatia, Aug 29-Sep 01, 2006. Winkler D., Biffl S.: “An Empirical Study on Design Quality Improvement from Best-Practice Inspection and Pair Programming”, 7th International Conference on Product Focused Software Process Improvement (Profes), Amsterdam, Netherlands, June 12th-14th 2006, [Presentation, 100KB]. Binder T., Winkler D., Biffl S.: “Quo Vadis V-Modell – Qualitätssicherung und Qualitätsmanagement im V-Modell 97 und V-Modell XT”, Technische Universität Wien, Technical Report IFS-QSE-06/03, 2006. Winkler D.: “Empirical Evaluation and Improvement of Projects, Processes and Methods”, Series of Lectures, TU Prague, Czech Republic, 12.04.2006. Biffl S., Winkler D., Höhn R., Wetzel H.: “Software Process Improvement in Europe: Potential of the new V-Model XT and Research Issues”, in Journal “Software Process: Improvement and Practice”, Volume 11(3), pp.229-238, Wiley, 2006. Biffl S., Thurnher B., Goluch G., Winkler D., Aigner W., Miksch S.: “An Empirical Investigation on the Visualization of Temporal Uncertainties in Software Engineering Project Planning”, Proceeding, 4th International Symposium on Empirical Software Engineering (ISESE), Noosa Heads, Australia, November 2005. Biffl S., Winkler D., Höhn R., Wetzel H.: “Software Process Improvement in Europe: Potential of the new V-Model XT and Research Issues”, European Software Process Improvement and Innovation Conference, November 2005, Budapest, Hungary, Wiley, 2005, [Presentation, 300KB]. Thurnher B., Winkler D., Biffl S.: “Usability Evaluation in situ – A Case Study on a Mobile Field Support Tool”, In-Use, In-Situ: Extending Field Research Methods Workshop, London, Great Britain, October 2005. Winkler D., Riedl B., Biffl S.: “Improvement of Design Inspections with Inspection and Testing”, Proceeding 31st IEEE Euromicro Conference, Porto, Portugal, September 2005. Winkler D., Biffl S., Thurnher B.: “Investigating the Impact of Active Guidance on Design Inspection”, 6th International Conference on Product Focused Software Process Improvement (PROFES), Oulu, Finland, June 2005, [Presentation, 73KB]. Winkler D., Halling M., Biffl S.: “Investigating the Effect of Expert Ranking of Use Cases for Design Inspection”, Proceeding 30th IEEE Euromicro Conference, Rennes, France, September 2004. Biffl S., Winkler D., Thelin T., Höst M., Russo B., Succi G.: “Investigating the Effect of V&V and Modern Construction Techniques on Improving Software Quality”, Poster Proceedings of ACM/IEEE International Symposium on Empirical Software Engineering (ISESE), Los Angeles, USA, August 2004. Winkler D.: “Empirical Evaluation of Inspections as a Quality Management Approach for Defect Detection in the Context of Software Engineering”, Diploma Thesis, Vienna University of Technology, May 2003. Don’t hesitate to contact me via E-Mail or visit my at XING or on my personal Website (in preparation).